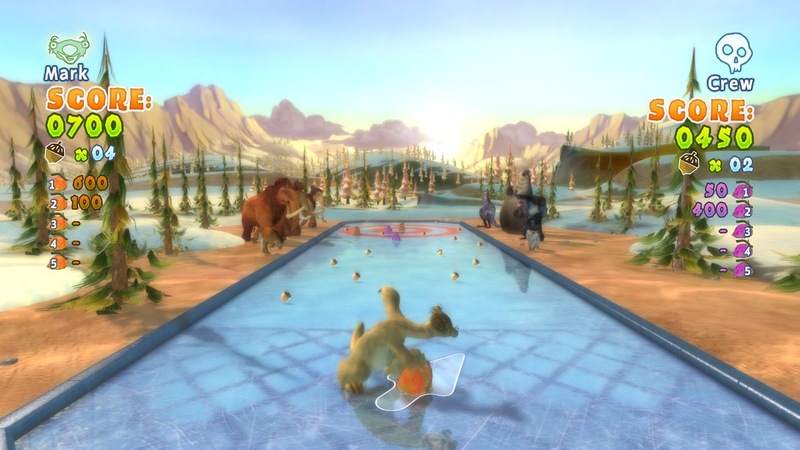 Ice Age: Continental Drift: Arctic Games (now there's a mouthful) was a game I was never originally going to get; in fact it was a game I never knew existed until my benefactor, Mix-Master, managed to gift me the game. I thought that since my daughter liked the animated feature "Ice Age" she'd probably like a game that features the same characters right? So I was more than happy to take the spare key off Mix-Master's hands and give it a shot. As you progress through the campaign mode you actually get to view different cutscenes depending on whether Manny or Captain Gutt's team wins the challenge. I think this is a nice touch and means they at least went to the effort of providing different cutscenes for different outcomes, instead of just having a generic cutscene in between each challenge or mini-game. Don't want to go through the whole campaign again just to play your favourite mini-game? No problem - you can select the mini-game you want to play and go directly to it with a minimum of fuss. Kids will still love it? I don't quite know if this is a good thing or a bad thing but it's good if the kid actually likes the game and knows how to play the mini-games since it will keep them entertained for a while. Doesn't seem like it's available any more? Despite the character models looking pretty similar to the film (which is a good thing) the graphics are also pretty dated by today's standards - not surprising considering the game was originally released in 2012. If you play the campaign (which contains all the mini-games) it takes only 45 minutes to complete. The scriptwriting is really terrible. Many times it seems that certain cutscenes are trying their best to be funny but instead they just make you cringe. They also add absolutely nothing to the game as a result except the urge to /facepalm every few seconds. The mini-games seem to be targeted towards older kids - ones that are able to memorise all the relevant keys and have the reflexes to react in time. Younger kids might find the game a bit too challenging but I would've thought younger kids were the actual target market for this kind of game. Thank God this abomination of a game isn't available on Steam any more. Okay, the kids will probably love it anyway because it's a video game based off Ice Age but that's the only thing this game has got going for it; dated graphics, a short campaign mode, poor voice acting, terrible scriptwriting and mini-games that are too difficult for some kids means I simply can't recommend this game. Is the game worth $??? USD? : Yes, "$???" is not a typo, since I'm not quite sure how much the game is nowadays or if it's even available for purchase anywhere; Steam certainly doesn't sell it. If I were to put a price on this game though, it wouldn't be more than $5; it might be of some entertainment to kids who are fans of the film but that's the only thing that's going for it.